Painted in 1990, Robert Taylor's 'Gathering Storm' is typical of the superb skyscape aircraft scenes that he conjures up. When the original drawing stage was finished, Taylor felt that the scene lacked something. 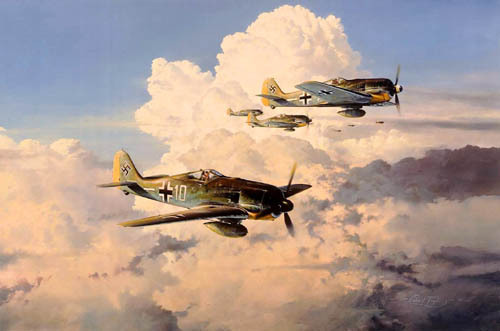 He then added the long range fuel tanks that many FW190's had, and bingo, the painting came to life.